"Dancing at the Stone Church"
"Morning Light in Valle de St Martine, Italy"
I recently received a call from Carol Keiser, who has worked as an artist for over 30 years, the first dozen spent producing and decorating stoneware pottery. In 1985 she began creating original hand-painted tiles and now divides her time between her Putney tile studio and a home in Mexico, where she works on many of her paintings. She wanted me to know that she would be exhibiting several large canvases during July in the Edw. Jones/Joseph LoMonaco agency at 51 Main Street, Brattleboro. Frankly I was a bit star-struck because the two Carol Keiser tiles in my home are particularly dear to me. One, a wedding gift to my husband in 1995, depicts a loving couple floating with a huge bouquet of flowers over what I interpret to be the ocean, a symbol of my husband's move across the Atlantic to join me here in Vermont. The other, from long-time friends on the occasion of my fiftieth birthday two years later, is of a woman napping in a flowered, overstuffed chair with a sleeping cat and a bowl of fruit nearby; the rich colors and serene affect are inviting and comforting. "The expressive use of color and line are important elements in Carol's work," reads her bio. 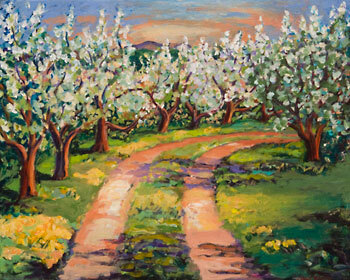 "The tile designs are often derived from her paintings. Underglazes are applied with sponges to build up the background colors. The details and final black line drawing are done with fine sable brushes. The tiles are glazed and fired with a clear transparent glaze that allows the brilliance of the colors to shine through." The element of surprise is always in play, of course, when using glazes, as Carol can attest; with practice, the outcome is satisfying more often than not. My appreciation for these small works of art, only 4x4 and 6x6, led me to offer Carol the cover story in this edition of the Gallery Walk guide, since otherwise I had no plan in place, and I knew her larger compositions would be just as pleasing. She reciprocated by inviting me to visit her studio in Putney to see her paintings and gather some material and images for a story. I suspect that artists such as Carol, who work consistently on a small scale, find it liberating to "think big" for a change. 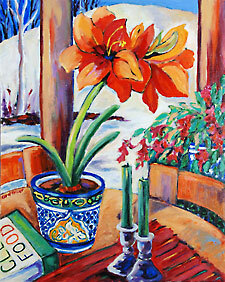 I recall Sat Kaur Khalsa's larger canvases complementing her expertly turned and painted porcelain wares. And I, as a graphic designer and calligrapher working with tiny measurements and exacting placement of elements, find myself hankering to let loose and fill a gargantuan canvas with swaths of color (and maybe a letter form or two, just for balance ... or maybe not -- I'm still dreaming of a day I'll find the time!). 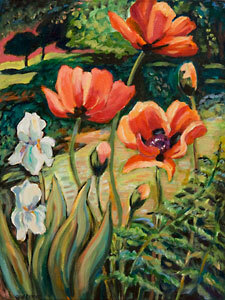 "As I look at them now in a group, I see that a pattern is emerging in what I choose to paint. These works are mostly about my response to a place, a moment in time, or a memory. They are about something that caught my eye and gave me a particular visual and emotional response of pleasure and delight. Whether it is the sun shining through the leaves, a walk through the orchard, dancing, a view of my kitchen table, a corner of my studio, my garden, or places I have visited, it begins to add up to be a record of my life and my response to the beauty around me. It is a visual diary of my life and my joy." Carol has some habits that help keep her in touch with that joy. 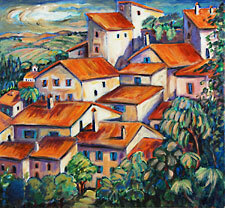 Her travels and art seminars in New Mexico, Costa Rica, and Italy, and the time she regularly spends working on paintings in Mexico, have influenced the warm palette of colors in which she works. 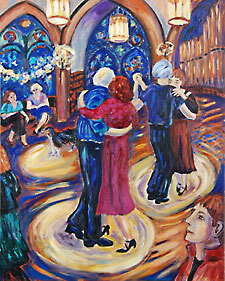 She has also recently become "hooked" on ballroom dancing; so, on Gallery Walk evenings, and some other weekends, too, she may be found at the Stone Church (at Main and Grove), dancing for fun and exercise. One of the largest paintings in the Edw. Jones exhibit was inspired by this new passion. 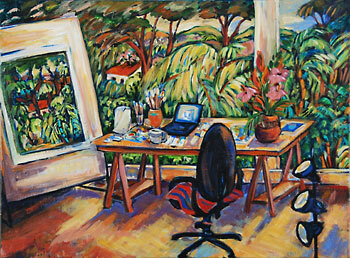 The summary of Carol's three-plus decades of professional experience is impressive, including a long list of important exhibits, awards and commissions; her paintings are represented in three New England states and her tiles in numerous fine craft outlets -- as far away as London, England, according to a traveling acquaintance of mine. She designed an Artist's Mug in 1999 for the VPR fundraising series and an ornament for the White House Christmas Tree in 1993. But what she gets the most pleasure from, I expect, is taking up color on her sponge or brush to create one more reminder of the visible joys in her life, whether in Vermont or further afield.